Connect to S800c enables you to quickly and easily transfer images from a Nikon S800c digital camera to an iPhone, iPad or iPod touch via wireless connection. You can then use other apps to upload your photos to social networking sites, attach them to e-mails, etc. -Connects an iPhone, iPad or iPod touch to a Nikon S800c digital camera via Wi-Fi®. -Enables thumbnail display of photos in the Nikon S800c digital camera. 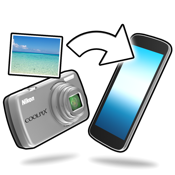 -Enables transfer (copying) of photos from the Nikon S800c digital camera to the iPhone, iPad or iPod touch. -Facilitates initial setup for communicating with Upload to Smart Device application inside the camera. Subsequent connections are automatic. -Because photos are loaded on a camera roll, it is simple to use them with various apps on the iPhone, iPad or iPod touch, uploading them to social networking sites, attaching them to e-mails, etc. -As well as loading photos at their original size (currently 8-megapixel maximum owing to the restrictions placed on iPhone, iPad, and iPod touch), Connect to S800c enables reducing images to either 2-megapixel or VGA size for transfer. -Connect to S800c is only for use with the Nikon S800c digital camera. -Only video files with resolutions supported by the device can be loaded (unsupported files are not shown as thumbnails). -Images cannot be transferred via USB cable. -Depending on device settings, Connect to S800c may not run or operation may be unstable. -Transfer speed may vary depending on the type of device and the surrounding environment. -Compliance with wireless regulations means that photos may be transferred over distances no greater than 10 to 15 meters. Transfer range may be reduced by poor signal conditions and objects that interfere with transmission. -Do not use this software on aircraft or in hospitals, etc., where wireless communications are restricted. -iPad, iPhone, iPod touch are trademarks of Apple Inc.
-All other company names, brand names and product names are registered trademarks or trade names of their respective holders.